William Cronon. 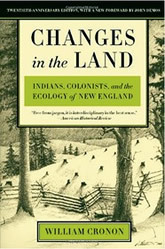 Changes in the Land: Indians, Colonists, and the Ecology of New England. New York: Hill & Wang, 1983. In this landmark work of environmental history, William Cronon offers an original and profound explanation of the effects European colonists’ sense of property and their pursuit of capitalism had upon the ecosystems of New England. Reissued here with an updated afterword by the author and a new preface by the distinguished colonialist John Demos, Changes in the Land, provides a brilliant inter-disciplinary interpretation of how land and people influence one another. With its chilling closing line, “The people of plenty were a people of waste,” Cronon’s enduring and thought-provoking book is ethno-ecological history at its best.